Dr. Patel’s Educational Sleep Apnea Book is Now Available! That’s right! 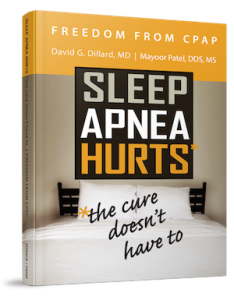 Dr. Mayoor Patel is proud to announce the publication of his book with Dr. Dillard, “Freedom from CPAP: Sleep Apnea Hurts, the Cure Doesn’t Have To.” Sleep apnea is a silent killer. It destroys your memory, motivation, and even your relationships. Sleep apnea can also hinder your job performance, ultimately preventing you from furthering your career and life. In “Freedom from CPAP: Sleep Apnea Hurts, the Cure Doesn’t Have To,” Dr. Patel and Dr. Dillard team up to provide educational information on sleep apnea from both an ENT and Dental perspective. Many people are unaware they suffer from sleep apnea, which is why visiting the dentist or ENT is important. By getting proper diagnosis and care, you can take back your sleep and your life, eliminating further complications. By reading Dr. Patel’s book, you can help yourself or a loved one who is suffering from sleep apnea. To purchase this book, please visit http://www.lulu.com/spotlight/sleep. Whether you choose an ebook or a hard copy, you are taking charge of your life to get a better night’s sleep for a healthy you. Dr. Mayoor Patel looks forward to helping his patients improve their health through the treatment of sleep apnea, as well as keeping patients informed. No matter where you are located, there is a sleep team near you. Each sleep team is ready to help with your patients’ sleep problems. As a dental sleep medicine specialist, you play an integral role in the treatment of your patients. However, you do still need a sleep team to help you along the way. Let’s get to know the other members of a sleep team. As a dental sleep medicine specialist, you maintain the ability to recognize a sleeping problem before it worsens, while also being able to provide effective treatment for your patients. Dr. Mayoor Patel is available to help you learn more about your role as a dental sleep medicine specialist and how you can successfully treat your patients. It’s that time of year again. As the holidays have ended, you might be thinking about your New Year’s Resolution. For 2015, take charge of your practice and make a resolution to provide improved care and services. By expanding your practice to properly treat patients with sleep apnea or TMD, you can significantly improve your patients’ oral and overall health. In 2015 you will have the availability of fresh, new classes and lectures you can attend for Dental Sleep Medicine. Beginning in January, you can visit Nierman Practice Management, where Dr. Patel is the Clinical Education Director, for an up-to-date schedule of continuing education courses. By completing continuing education courses, you can offer your patients further services and resources to better meet their individual needs. And, not only can you attend continuing education courses, but your entire staff can as well! Another area of your resolution to improve your practice can be patient education material. By helping your patients better understand sleep apnea, TMD or any other area you can ensure they can take care of themselves after leaving your office. You can improve educational information by providing brochures/pamphlets, and properly answering a patient’s questions while in the office. When you provide your patients with exceptional educational information, you can continue to help them long after they leave your office. Take a stand in 2015 and improve your practice by not only attending continuing education courses, but also by providing appropriate educational information for your patients. Make your resolution for 2015 one that will not only help your office, but your patients, as well.